A group of SU students and Syracuse high school students mixed up various recipes as part of a project for the high school students to create and potentially market a healthy snack. The Mary Ann Shaw Center for Public and Community Service celebrates its 20th anniversary this year as the centerpiece of SU’s community engagement initiative. The Shaw Center brings together students, faculty and staff with community partners in projects for reciprocal learning, academic growth and professional and personal development. This is the first in a series of stories that highlights some of the center’s projects and people. Start with oats. Mix in dates and whole wheat cereal. Then combine with honey, cranberries, a small amount of butter and a good dose of experimentation and curiosity. For four Falk College and Whitman School students and a group of high school students, the recipe to develop a healthy snack is about more than just the raw ingredients. The SU students have been working with a group of students at the Hillside Work-Scholarship Connection in Syracuse since last semester to develop, create and possibly sell a healthy snack, especially geared toward young people. The project, Recipe for Success, is a collaboration between the Hillside program, an after-school youth development program, and the Mary Ann Shaw Center for Public and Community Service. It’s showing students how to pursue an idea in the business world and what that could mean for them as a professional career. The idea for the project came about last spring from student interns working at the Shaw Center, says Elizabeth Mix, associate director for community engagement at the Shaw Center. They submitted an idea to the Clinton Global Initiative about working with high school students to develop a healthy snack and then using business and entrepreneurial skills to market and sell it. The Clinton Global Initiative accepted the proposal and the idea was developed further before it was put into action last fall. Support was provided by the Chancellor’s Office and Falk College. Shaw Center administrators worked with Hillside Executive Director Wayne O’Connor to see how it would fit into Hillside’s objectives and schedule. Four Falk and Whitman students are working with high school students on the Recipe for Success project. 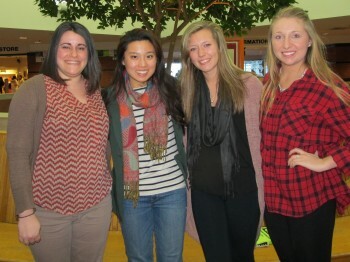 From left are SU students Kristen Conway, Jenifer La, Shannon Higgins and Katie Walter. Higgins and Jenifer La ’14, a nutrition major in the Falk College, who are interns at the Shaw Center, recruited Katie Walter ’16, a marketing major, and Kristen Conway ’14, a nutrition major, to join them in the program. The SU students came up with a syllabus that allowed the high schoolers to take the lead on how the project would progress, while the SU students would be there to guide them and as sounding boards. The students brainstormed ideas as they considered a collection of store-bought snacks and ingredients, such as dried fruit. La and Conway carefully considered how to find a balance between Hillside students’ typical snack choices and developing something nutritious that they would actually eat. “Our motto for last semester was to make something ‘nutritious and delicious.’ One group came up with a ‘midnight bar,’ inspired by a Twix bar, except we encouraged them to take a healthy spin and use ground sunflower seeds for the cookie, and replace the caramel with honey and dried dates,” La says. 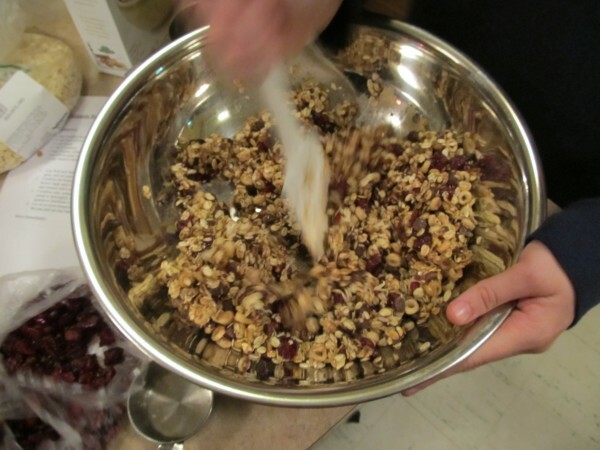 The high school students, who also visited the academic kitchens in SU’s Lyman Hall, decided to make a granola bar and tried several recipes. Hillside staffers tested out the snacks and the students even made out surveys, before finally selecting the one that included the oats, cereal, honey and cranberries. The high school students also got some insights on consumer products from Higgins’ father, a Pfizer executive who works on such brands as Advil and ChapStick and was in town for Family Weekend. He spoke to them about such concepts as researching the customer and how they perceive the brand. “They were engaged with him, asking him questions about business and product development,” Higgins says. 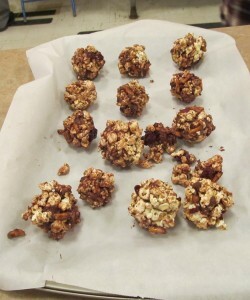 Several ideas were developed by Hillside students to create a nutritious snack. At the start of this semester, organizers are developing the project further to possibly create a competition between two groups of students to develop two different products and their own marketing plans. La hopes that the competition will enhance the overall process. “We want to re-emphasize that this is a team project and allow Hillside students to step out of their comfort zones and take ownership and pride in the snack products they’ve created,” La says. “It’s good for the students to see the goal, but there’s so many great things along the way—such as those close relationships that are built between the students and the learning that takes place—that ultimately if the end goal is not met, there’s still so much that was achieved,” Mix says. The SU students welcomed the close connections that were made through the conversations they shared with students.